Because LiDAR uses light, the target must be visible, so it is not an all-weather solution. It won't work well in fog or other weather conditions that affect visibility, but if conditions are clear, it can operate during both day and night. From comma.ai: Last week, we open sourced an advanced driver assistance system in order to help accelerate the future of self driving cars and provide a platform anyone can build on top of. We released both openpilot, driving agent research software, and NEO, a robotics platform capable of running openpilot, under the MIT license. Glenn McDonald for Seeker: Want to know what drones of the future will look like? 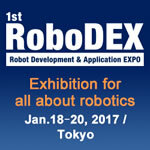 RoboDEX, a comprehensive trade show for robots, will be held at the center of robot/robotics industry, Tokyo, 2017. Covering from development technology of robots to application of robots, it attracts all the professionals involved in robot industry and professionals considering utilizing robots.